Since there is a steady turnover of visitors, the same questions get asked over and over again. My attempt to limit them to a “top 20″ list did not succeed, even when I combined several of the questions. Readers may contact me with more questions, which I will try to answer. Q: When was the nest discovered? How was the nest found? 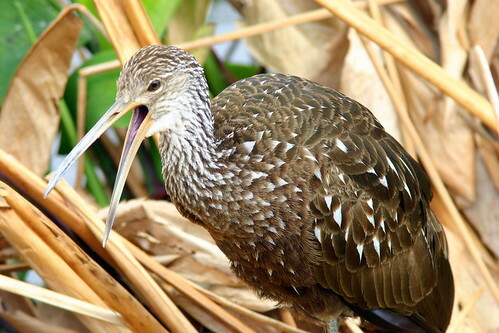 A: In early March, 2008, a local resident found and photographed the nest, which contained a single well-developed chick.She reported it to the Florida Fish and Wildlife Conservation Commission (FWC), and a spotter aircraft confirmed her sighting on April 9, 2008. Q: How long has the nest been here? A: We really do not know, but from the size of the nest it appears to have been in use for more than two seasons. Local residents have seen adult Bald Eagles in this area for several years, some carrying nesting materials and prey, but no one ever reported seeing the nest to FWC. Q: Does the same pair use the nest year after year? 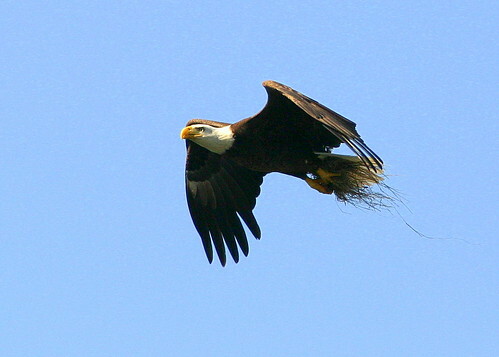 A: Bald Eagles commonly use the same nest, adding to it each subsequent nesting season. They sometimes alternate between another nest in their territory. Q: How do you tell the male from the female? A: Both sexes have identical plumage. Females are usually heavier than males, which can be noticeable if they are viewed next to each other. A more subtle difference is that the base of the female’s bill (measuring from top to bottom) is bigger than that of the male. In comparable photos, I found the ratio of width of bill at its base to the distance between iris and bill tip to be about 0.5 in the male and 0.6 in the female. Q: How many eggs do they lay? A: Usually two eggs, though sometimes there may be only one, and, rarely, a third. Q: When were these eggs laid? How long do they take to hatch? A: The first of this pair’s two eggs was probably laid on December 13, 2008. The second was deposited about 5 days later. They take about 35 days to hatch, on average. Q: When did these eggs hatch? A: The first egg hatched on or about January 17, and the second about 5 days later.Unlike many birds that do not incubate the eggs until an entire clutch is laid, the eagle begins incubation immediately. Therefore the first egg hatches earlier and this chick will be ahead of any subsequent siblings, giving it a competitive advantage. Q: How could you tell when they were laid and hatched? A: By changes in the behavior of the adult pair. On December 13 they suddenly stopped bringing in nesting materials, and the female remained sitting deep in the nest nearly all the time. Incubation was continuous until January 17, when both adults spent much time peering down into the nest, and the next day were seen bringing in prey and tearing off small bits of flesh to feed the chick. 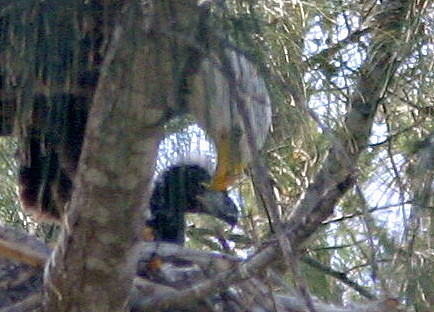 The female continued incubation and feeding until about 5 days later, when she stood higher in the nest, sheltering the chicks under her wings and not needing to incubate the second egg. Q: Does only the female bird sit on the eggs? 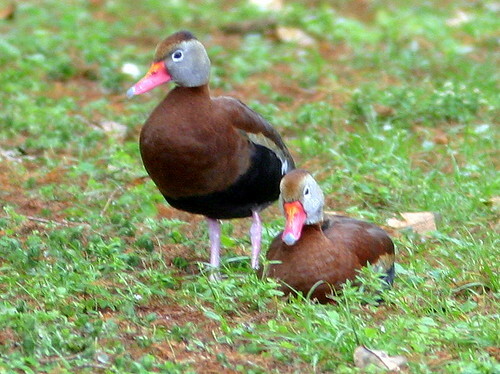 A; Both parents share incubation duties, though the female is said to spend more time at the task. We often saw them exchange duties early in the morning, and sometimes at various times of day. Q: How long do the chicks stay in the nest? When do they fly? 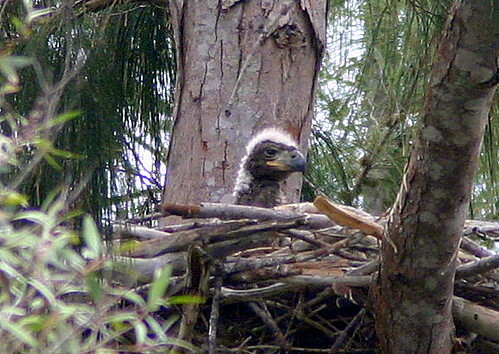 A: Eaglets stay in the nest for about 11 weeks. They may begin to climb out on the branches of the nest tree during the last week or so, where they exercise their wings. Their parents begin to bring less food and entice them to clamber after it. The chicks lose some weight as they develop the ability to fly. Q: Is it true that chicks sometimes kill their siblings? A: The first hatched chick is larger and stronger. 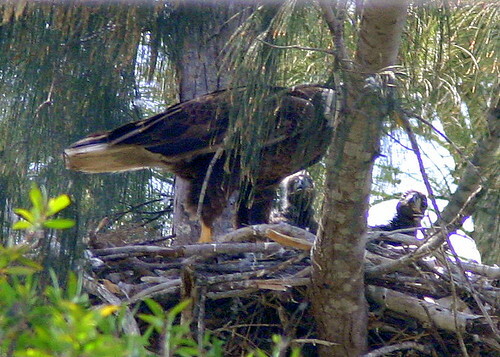 If food is scarce, or if one of the parents dies, the larger eaglet may keep the smaller one(s) from getting enough food, and they may fail to thrive. Older chicks are known to push their siblings out of the nest, and in rare instances, may even eat them. This behavior is actually a survival strategy, as it may assure that at least one eaglet survives when there is a scarcity of food. Q: How long do the parents keep taking care of them after they fly? A: The eaglets will stay near the nest tree for about another month, still dependent upon their parents to bring them food. Then they instinctively develop hunting skills of their own and become independent. Q: What do eagles eat? A: These eagles catch a lot of fish, or steal them from Ospreys. 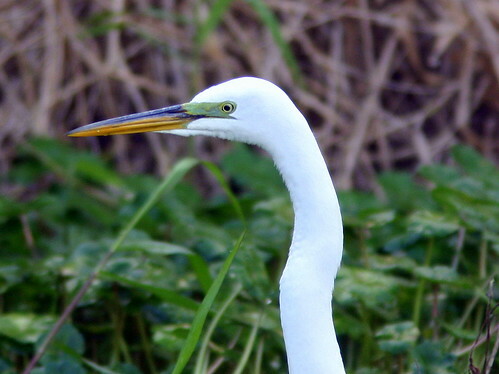 They often bring in birds such as Cattle Egrets and White Ibises. They have been seen carrying in snakes as well. Q: Where do they go after fledging? A: Here in Florida, most eagles migrate northward. In the northern US, Bald Eagles move southward as lakes freeze up. In Florida, there are two general patterns of migration. Eaglets from the central and northern parts of the state go up the east coast, with many congregating on Chesapeake Bay in Maryland. 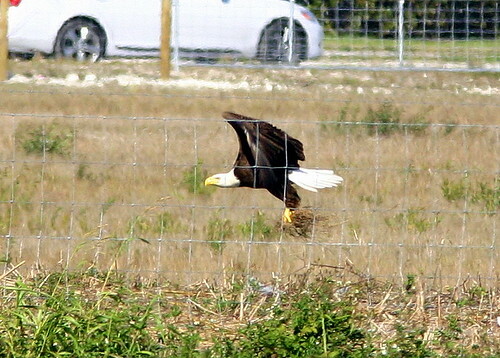 Eagles from the southern tip of Florida tend to wander within the State. All return to the general area of their nest around October. 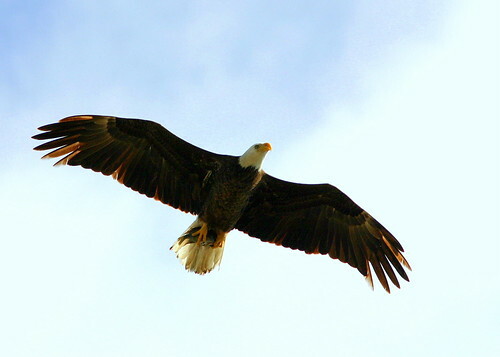 Bald Eagles from Canada and the northern USA tend to return to the nesting territory in late winter or early spring. Q: Do they come back to the nest? A: Sometimes they will visit their nest tree, but they will not be welcomed by the adults, as they will already be in the early stages of courtship and nest building. 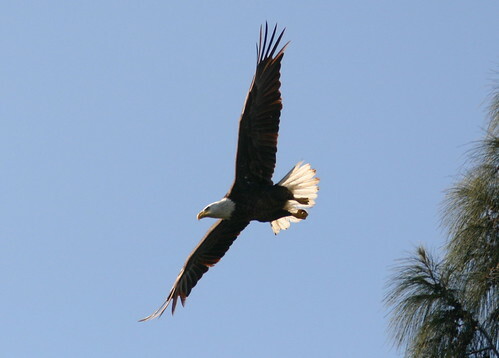 Eagles generally protect the territory around their nest, out to about a two mile radius. 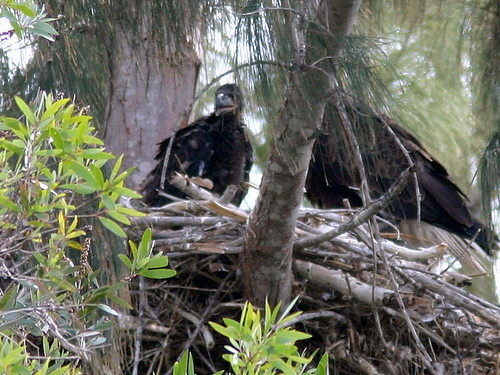 Q: The eaglets look black. When do their heads turn white? A: The chicks will develop the white heads and tails of adults when they are about 5 years old, which is also when they begin to breed. Q: How big is their wingspan? A: Up to about 8 feet. 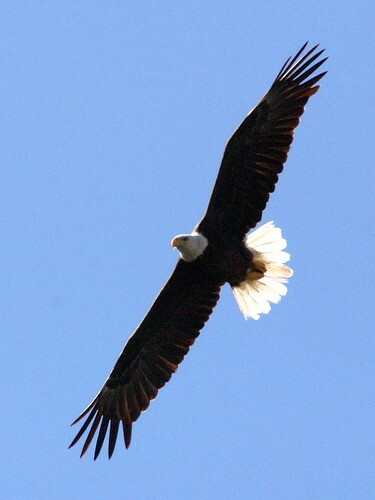 Northern eagles, such as in Alaska tend to be bigger than the Florida race. Q: Do eagles make a noise? A: Eagle watchers are sometimes disappointed when, expecting a majestic scream, they hear the birds’ chirping call. The chicks squeak softly as they beg for food, barely audible above the noise of traffic. Q: Is it true that eagles mate for life? A. Generally, yes. Around November the pair get closer and start courting as if they were falling in love for the first time. If one of the pair dies, the other will quickly seek another mate. Q: Does the pair stay together during migration? A. No. 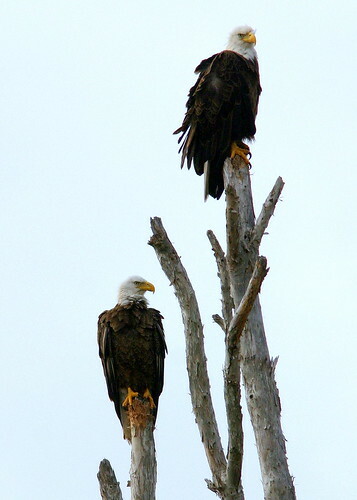 After the chicks become independent, the adult birds go their separate ways for the remainder of the summer and, in the case of Florida’s eagles, until fall, when they both return to the vicinity of the nest. They become re-acquainted and “fall in love” all over again every year. Q: Are there many eagles in Florida? 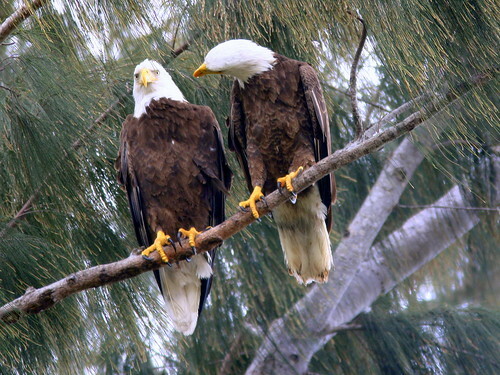 A: Florida, with 1133 breeding pairs counted in the last national survey in 2006, was second only to Minnesota (with 1312) in the number of active Bald Eagle nests in the lower 48 States. The 2007-08 Florida count climbed to 1,280, according to FWC. It is believed that another 20% of nests go unreported. Q: Are eagles still considered endangered? A: Bald Eagles were removed from the Federal Endangered Species List in 2007, but they continue to be protected by Federal and State laws and guidelines. 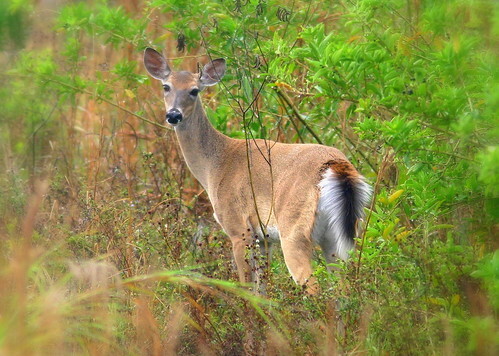 In Florida, the species is well-established and not in peril statewide; however, as it establishes new territories that can come in conflict with humans, it faces the threat of local extinction. Q: Why don’t our eagles have white feathers on their legs? A: All Bald Eagles’ “leggings” are brown, the same color as their body. Only the heads and tails of adults are white. Some other eagle species, such as Steller’s Sea Eagle (which nests in far northeastern Russia) have white feathers on their legs. 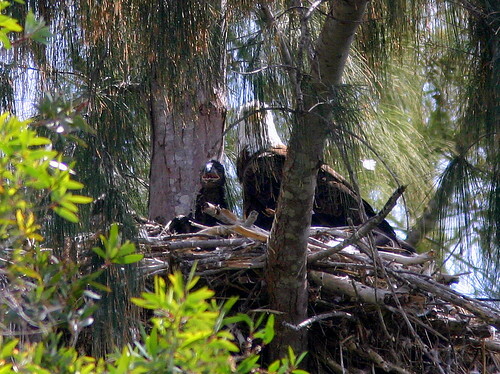 Q: Is this really the first eagle nest in Broward County? A: Before DDT and persecution of eagles had devastating effects on the its population, Bald Eagles ranged all over Florida. After DDT was banned in 1972, The states monitored their eagle populations and tracked their recovery. Since then, a nest was found in the far western part of Broward County, but it never was shown to contain eggs or chicks. 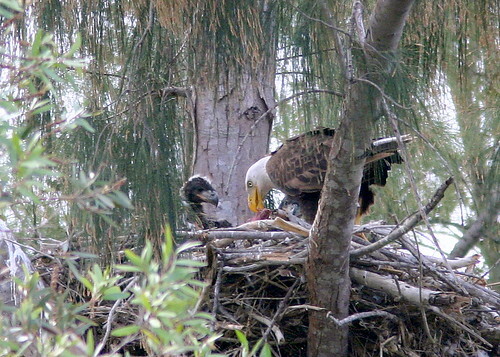 The Pembroke Pines nest is the very first active eagle nest to be registered in Broward County. 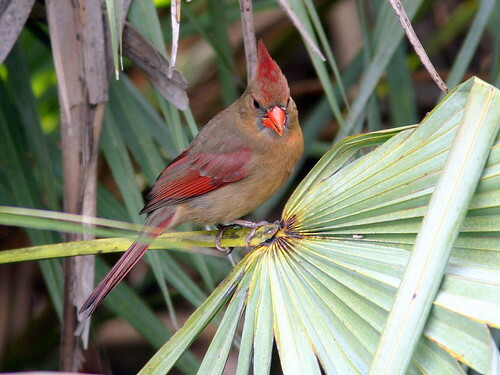 Of course it is possible that other earlier nests went unrecorded, as the species has nested in northern Miami-Dade. Q: Do eagles always nest high in trees? 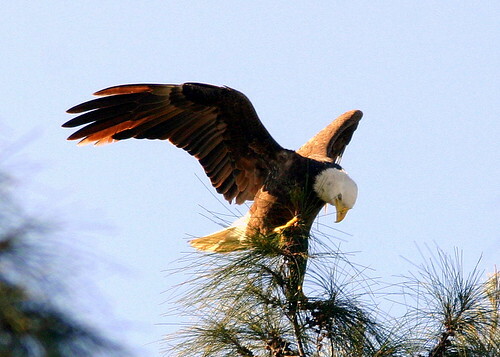 A: While Bald Eagles seem to prefer trees, they may nest on the ground or on cliffs. 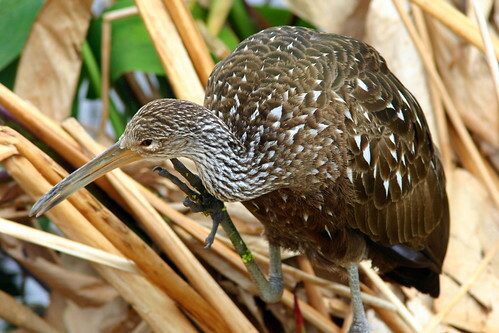 In coastal areas of Florida, they may nest in mangroves, only a few feet above ground level. They may even use artificial structures, such as cell phone towers. worked to the advantage of the species. 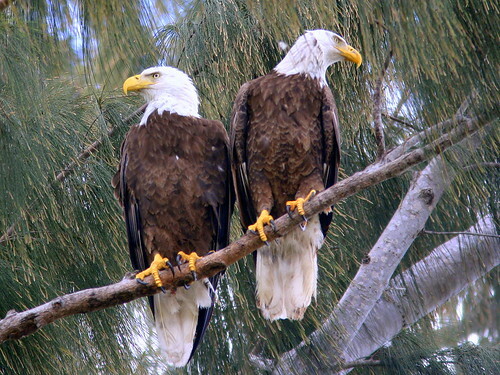 Q: Why did these eagles nest in the city, when there is plenty of land for them in the Everglades? A: Several factors may be at work here. 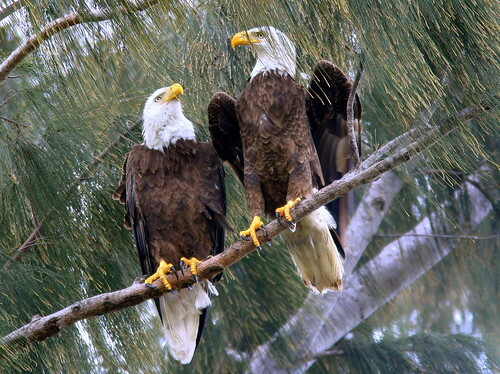 First, Florida’s eagle population is increasing quite rapidly. Second, suitable rural and wilderness nesting areas are disappearing as land is cleared, wetlands are filled and housing is expanded into their historic range. Third, catastrophic events such as fires may suddenly displace large numbers of adult eagles. Fourth, the many quarries and lakes in urbanized areas provide a plentiful food supply. All this adds up to the inevitable need for the birds to seek suitable nest sites nearer to human habitations. “The parents and eaglets were very active during the period 9am-noon. Friday, February 27 UPDATE: Good news, which will inconvenience watchers, but better protect the eagles.The City of Pembroke Pines will now implement further protections for the “Eagle Forest.” A more permanent 6 foot metal chain link fence will be erected along the “palm line,” where the present temporary orange fence is located. Work on this phase starts very soon . This fence, donated to the City by Mitigating Circumstances, will run 1000 feet, the whole length of the block between SW 208th & 209th Avenues. I just checked with the City. They will not use mechanized equipment (e.g., air hammers) near the nest. Instead they will hand dig and use rubber mallets. The earth there is very soft and not expected to contain much rock. A temporary orange plastic fence will also delineate the rear (south) corners of the city-owned 20 acres that make up the woodlands. The Water Management District land to the west and south, where the eagles often roost on the melaleuca trunks, will not be fenced. Signs will be placed that meet the Florida Fish and Wildlife Conservation Commission (FWC) requirements for protection of the Bald Eagle nest. Pedestrians will be prohibited on the entire south side of the block. Local police will have power to enforce (ticket) violators, an enforcement action not available directly to FWC. Florida DOT must approve the next step, which will be to place the temporary orange fencing along the north edge of the Pines Boulevard pavement. This will eliminate parking on the shoulder, and all viewing of the nest must take place from across Pines Boulevard, on the north side of the road. The plan would be to place a 4 foot orange plastic fence, suspended between soft barriers (such as orange barrels filled with water). Don’t be alarmed when the City begins installing the fence. On another note, I believe that Florida Power & Light (PF&L) has good reason to trim the tall Australian Pines that overhang the utility wires. Obviously, they pose a threat in the event of a hurricane. The eagles frequently use these trees as roosting sites. 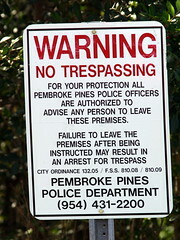 FP&L does not require City of Pembroke Pines approval to do such work, as they already have rights under an easement. They must be notified, that such trimming, which involves gasoline saws, creates a hazardous disturbance to the young eagles, especially during the coming weeks, when they will be climbing out on the branches of the nest tree and are prone to fall if startled. the eagle site until around June. If they are, a delay will be sought. If other contact with FP&L is initiated, please let me know and we can close the loop and keep everyone informed. Obviously, in the meantime, if any of the Eagle Watchers see a tree trimming crew (e.g., Asplundh) begin to work, please have then call the office of Mr. Charles Dodge, Pembroke Pines City Manager, at (954) 431-4884. Such work must be delayed until late March or early April. As for FP&L, I have had wonderful cooperation and communication from the City of Pembroke Pines! Thursday, February 26: Yesterday, many eagle watchers were alarmed because they only saw one eagle in the area all day, from 8:30 AM (when the chicks were fed and it was possible that a second, unseen adult brought in the food), until late afternoon. A reporter from NBC Channel 6 appeared on scene in the early afternoon, and several people expressed their concerns about the “missing” adult, fearing it had been injured or killed. I told the reporter that it was too early to jump to such a conclusion, as the eaglets are fed much less frequently, now that they can gobble down very large chunks of prey. On the early evening news, the reporter voiced these concerns anyway. Then the second adult showed up and brought in prey at about 5:30 PM. I notified him and, to his credit, he clarified this in the late news show. Last month, NBC6 was the first station to contact me about the nest, just around the time that the controversy had broken out over the imminent construction right in front of the nest site. Many people were up in arms and threatened to picket the site, as it took us over a week to find out what was planned and who was doing the construction. One hundred-twenty Middle School science class students were engaged in a study of the effects of traffic on the eagles’ behavior; they and their parents worried, not only that construction would interfere with their project, but that the eagles might be harmed by construction so near to the nest.. Someone probably tipped the reporter off and had him contact me for information. I asked that the station hold off on reporting on the nest until the (then newly-hatched) eagles were fledged. He complied with my wishes, and his reward was that his station was “scooped” this past week by Channels 6 and 10, as well as by the Miami Herald and the Sun-Sentinel. NBC6 has been a friend of the Bald Eagles. Last year, the station sponsored the placement of a satellite transmitter on a fledgling in the Everglades. Unfortunately, that signal was lost in a matter of a few days. Wednesday, February 25: We were away birding in Palm Beach County all day yesterday and this morning. We returned today to find that the City of Pembroke Pines had responded to our request that they put up “No Trespassing” signs at the boundary of the city property that contains the nest. The Pembroke Pines officials were alarmed at the report of a photographer, all decked out in camouflage gear and carrying a camera with very large lens, who entered the woods and approached the nest tree. Apparently a “professional,” his action alarmed the several lay people who were keeping their distance and observing the nest quietly from about 200 feet on the south side of the road. He was said to be “nasty” when one of the “non-professionals” pointed that he should not have gone so near the nest. I hate to give him any credit, but we can probably thank this creep for the City’s decision to ramp up measures to protect the nest from unusual disturbances. 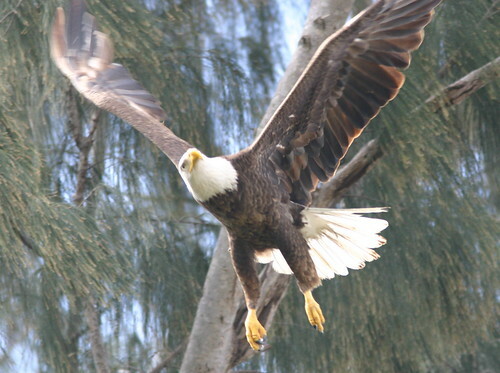 The City is apparently in negotiations with the Florida Fish and Wildlife Conservation Commission (FWC) as well as officers of the Broward County Audubon Society, to determine what is best for the eagles and the viewing public. I have been more concerned about public safety, as the birds appear to have adapted to the crowds that now visit the nest daily. As an important first step, the city has now posted “No Trespassing” signs along the front (north) boundary of the 20 acre woodland patch (which we call the “Eagle Forest). 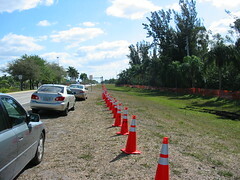 Additionally, a four-foot orange plastic fence now provides a physical barrier against entry into the woods, and traffic cones have been placed by the Pembroke Pines Police Department in a row about ten feet in from the edge of Pines Boulevard, forming a buffer zone about 40 feet wide in front of the posted area. These are intended as a deterrent against visitors approaching any closer to the nest, but some people think they only apply to vehicles, and must repeatedly be asked not to move past the boundary demarcated by the pylons. More must be done about this– signs prohibiting entry into this buffer area and perhaps, an additional fence may be in order. Also under negotiation are other measures, such as prohibiting parking on the entire south side of Pines Boulevard between 208th and 209th Avenues, and limiting eagle watching to the north side of the road.. Since there is no shoulder on that side, viewers would have to park on the south side of the road east of 208th and west of 209th.This could present the problem of gawkers slowing or stopping in the traffic lanes or in the right turn lane just east of 209th, risking a rear-end collision. People may try to cross at locations without a traffic signal. At around 7:00 AM the school buses on their way to the High School queue in the turning lane, and any vehicles obstructing traffic would surely be ticketed. Scroll down or click THIS LINK to view earlier daily reports on the eagle nest. 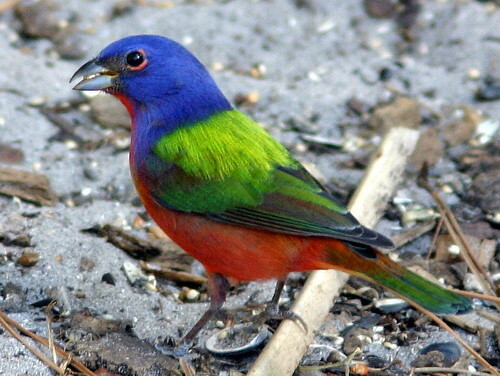 The Painted Bunting is one of the most beautiful of our North American land birds. 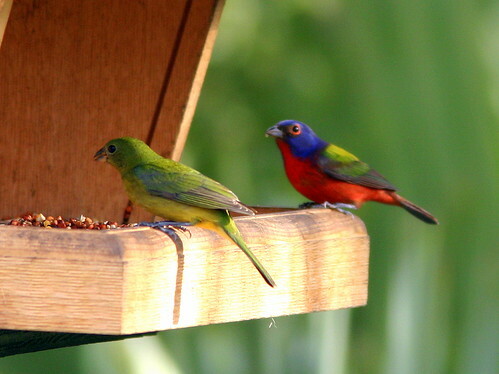 The female is a splendid green, matched only by some parrots and the Green Jay– except for splashes of green on some other birds, such as ducks, I can’t think of any others so colored. 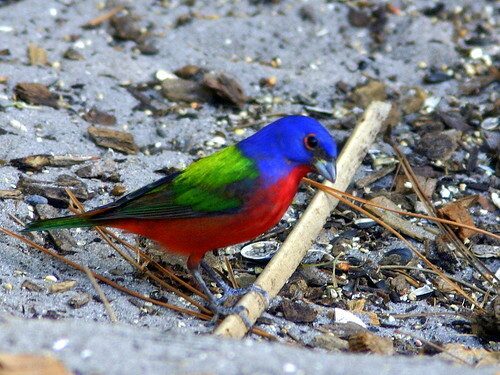 The male is ‘painted” surrealistically in bright red, blue and green. 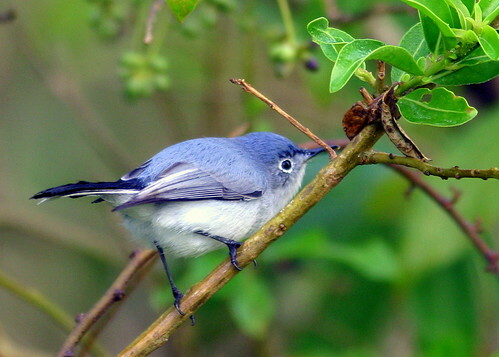 It was one of Mary Lou’s most sought-after birds. She finally got a brief look at one in Corkscrew Swamp this year. This past Tuesday, we took a break from watching our local Bald Eagle nest (where the area around the nest has finally been temporarily fenced and posted) and spent all day birding wetlands in western Palm County. We had four “target” birds that we had seen previously, but really wanted to get better looks and perhaps photograph them: Snail Kite, Limpkin, Black-bellied Whistling-Duck, and Painted Bunting. We started at Loxahatchee National Wildlife Refuge, worked our way west to the nearby Wakodahatchee Wetlands, in Delray Beach, and thence to Green Cay Nature Center in Boynton Beach. After checking in at a nearby motel, we had a very nice dinner with one of my old friends and his wife who were visiting Florida from their home in New York. He was my classmate all the way from Kindergarten through High School in Rutherford, New Jersey. The next morning, before heading home we went on to Okeeheelee Nature Center in West Palm Beach. We dipped on the Snail Kite at Loxahatchee, which is usually the best place to find one. One had been roosting near the Visitor Center just the day before, but they are said to be easier to find when they begin nesting in a month or so. 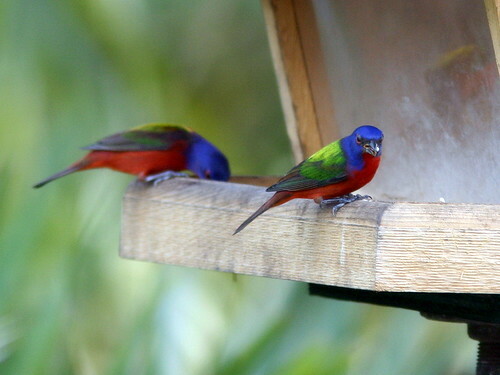 Okeeheelee is famous for the Painted Buntings that gather at the feeders near the interpretive center. We were not disappointed. Monday, February 23, 2009: The Sun-Sentinel published a story this evening about the eagles, to hit the newsstands in the morning. This is sure to attract more visitors, something that poses an even greater threat to the eagles as they approach a vulnerable stage in their life cycle. Now 5 weeks old, they normally will be expected to fly away from the nest tree at 11 weeks of age. From about the ninth week on, they will explore the branches around the nest. Their flight feathers will not be fully developed and they will be fat, weighing as much as the adults. Their parents will begin to deprive them of food and entice them to move about and test their wings by flapping in place. They will also lose weight in preparation for free flight. Any undue disturbance may startle an eaglet and cause it to fall to the ground. Because the adults have eight foot wingspans, they cannot fly down among the trees to feed their chick. Even if it survives the fall, the youngster will die of starvation or be eaten by predators. If anyone notes that an eaglet has fallen or is missing from the nest, please immediately notify eagle biologist Brian Mealey of the Institute of Wildlife Sciences at (305) 975-0200. Brian will try to retrieve it. It follows then, that it is important for all observers to avoid sudden movements and not let children or pets run about in the area in front of the nest. Never walk directly towards the nest, as this can alarm the birds. Of course, do not enter the wooded area. Ideally, all observations should take place from the north side of Pines Boulevard, as viewers will be about 300 feet from the nest, a much more comfortable distance for the eagles. The parents are not likely to abandon the nest once the chicks have hatched, but disturbance could cause changes in their behavior. So far this has not happened. The chicks are being fed and the adults are roosting in nearby trees or even at the edge of the nest at night, despite the presence of so many human visitors. The chicks ate well. One adult (presumably the male) brought in a medium-sized white bird (probably an ibis or Cattle Egret). The other adult proceeded to pluck it at the nest as the chicks looked on. White feathers were flying everywhere. Sunday, February 22, 2009: The number of visitors remained quite high,and nearly everyone observed traffic regulations. Since viewers congregate near the roadway and some motorists do not even slow down as they pass all the parked cars and people, it is essential that children be kept under control. There is one disturbing event to report. A photographer with a very large camera, and decked out in camoflauged gear, entered the woods directly in front of the nest (about 150 feet from the nest tree) and presumably approached it. Possibly a “professional,” he is someone who should have known better. Not only was he trespassing, but he was creating a disturbance within 330 feet of the nest, which is forbidden by state and federal guidelines. Lay observers who did not even know about the Bald Eagle protection rules or the American Birding Association’s Code of Birding Ethics recognized this as shameful behavior and wanted to call law enforcement (someone was said to have photographed his license plate number). Birders and professional photographers should be teaching others by their example. Saturday, February 21, 2009: The Miami Herald had a front-page story about our local eagles. Quite a few people are stopping by to look at the Bald Eagle nest and its occupants. I am asking for volunteers who are willing to put in an hour or so at the site, to remind people of safety measures. It is also an opportunity for you to share your knowledge and/or the sense of awe expressed by so many of the onlookers, many of whom have never seen a Bald Eagle in the wild. If you can spare an hour or so between the hours of 9:30 AM and 4:00 PM during the next few weeks, please read the “Call for Volunteers, follow the directions and enter your time in a “New Subject” line and post to the FORUM page of our Eagle Web Suite. Directions to the nest site are here: Eagle Locator Map. Whether or not you wish to offer interpretation to the visitors, brush up on your knowledge of Bald Eagles by clicking on the “Local Bald Eagle Nest” box to the left of this page, and visit these Information Links. Visitors are asked to park in the grass, several feet away from the pavement of busy Pines Boulevard. The eagles seem to be more tolerant of vehicles than humans, so observers should avoid walking towards the nest. Since the eagles can be disturbed by excessive motion, eagle watchers should observe quietly and not permit children to run about. The oldest of the two chicks (on the left in the above photo) was hatched on January 17th, making it 34 days old today. Both have grown quickly. Their dark beaks are now almost as large as those of their parents, and their fuzzy white coat of down is being replaced by black feathers. It will be five years before they acquire the yellow beaks and white head and tail feathers of their parents. Yesterday morning, we watched as one of the parents brought in a medium sized fish. It appeared to be a tilapia. Fish is a staple food for eagles. They pluck them from the surface of suburban lakes, or steal them from the Ospreys. They sometimes catch water birds, such as ducks, egrets and ibises. This morning was a cool 72 degrees and foggy. I set out at 7:00 am on my walk through the West Miramar Environmentally Sensitive Area (ESA), our local “patch” of recovering Everglades. 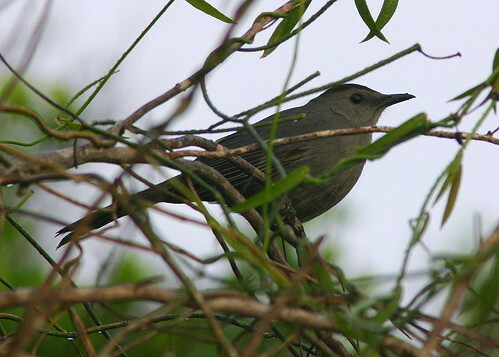 Pressed for time, I realized after walking the first 100 yards from home that I had forgotten to bring my binoculars, but I continued rapidly on my 1/4 mile trek to the wetland area.. A Catbird peeked out through the brush in typical fashion. After the fog lifted a brisk breeze from the northwest felt mighty chilly. It began to look like rain, so I picked up the pace. 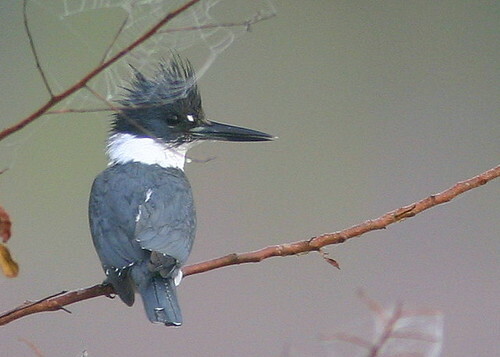 By the time I was a mile out I really feared getting drenched, so I hurried back, not even noticing a Belted Kingfisher perched low near the edge of the canal, only about 20 feet away. Luckily, it roosted again 50 feet down the path, and I cautiously approached within about 25 feet to get this shot. Later in the morning, still in a hurry to meet other obligations, I checked out our local Bald Eagle nest. The chicks had just been fed, and a couple of eagle nest watchers said they got nice views of the chicks feeding. However, they were now hunkered down. The first hatchling was 30 days old today.